The present case has been reported in the journal Neurology India. A 63-year old male patient presented with complaints of a gradually progressive swelling noted in the medial aspect of the distal left arm since 1 month, as well as tingling and shooting pain at the elbow radiating along the medial aspect of the forearm up to the little finger for 3 weeks. The pain was severe and hampered his daily activities considerably. The swelling per se was non-tender but the shooting pain described above was noted on pressing/tapping the swelling. On examination, severe sensory loss (pinprick, light touch, and temperature) was present in the ulnar nerve distribution in the hand (medial aspect of the hand and fourth and fifth digits) and Tinel's sign was positive at the cubital tunnel over the ulnar nerve. At the initial presentation, there were no signs of motor weakness. However, within a span of a few days, he developed clawing of left little and ring fingers, and on examination, there was intrinsic hand muscle (palmar and dorsal interossei, and third and fourth lumbricals) weakness. Nerve conduction studies showed a reduced ulnar nerve conduction velocity across the elbow. 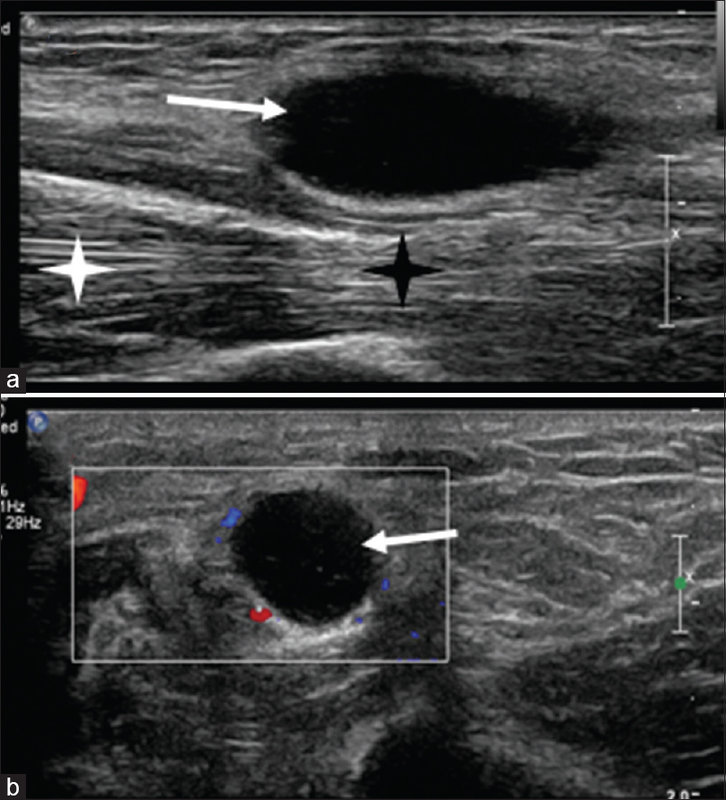 On ultrasonography, an anechoic cystic mass was seen apposed to the ulnar nerve along its course in the distal arm extending till the elbow joint. Neither internal echoes were seen nor was there any evidence of blood flow on color Doppler sonography. 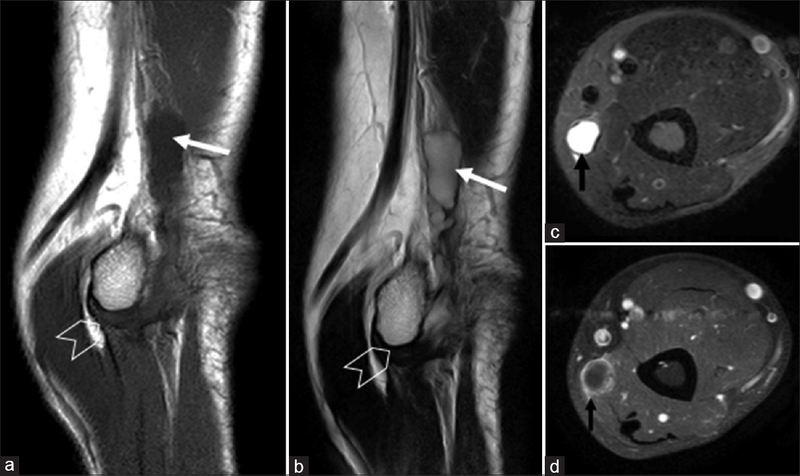 MRI revealed a cystic lesion on the medial aspect of the distal one-third of arm closely apposed to, and coursing along the ulnar nerve, although the nerve could be separately visualized. The cyst was located anteromedial in relation to the nerve, was uniformly hypointense and hyperintense on T1 and T2 sequences, respectively, and showed a rim enhancement. There were also a few small cysts seen distally along the nerve, with no obvious extension to the ulnohumeral joint. With a diagnosis of an epineurial ganglion cyst, under a regional anesthetic block, surgical exploration was considered. Intraoperatively, an 8-cm long, cystic lesion containing a clear mucoid, jelly-like content was seen arising from the epineurium and encapsulating the entire ulnar nerve, which seemed flattened and thickened with a normal-appearing nerve being visible superiorly and inferiorly. The capsule was fragile but could be dissected off from the underlying epineurial tissue. There was no intraneural extension. Complete excision of the cyst along with the involved epineurium was achieved using standard microsurgical methods. The nerve was adequately decompressed in its entire length. Histopathology revealed features consistent with a ganglion cyst. He had an excellent relief of his pain immediately after the surgery, that showed gradual recovery over time. At a follow-up of 20-month duration, there was a complete pain resolution, the sensory loss had improved remarkably, and a significant improvement in his motor weakness of intrinsic hand muscles was noted. No clinical evidence of recurrence was noted at follow up visits.